At GDS we realise how important it is to build government services by understanding the needs of the people who use them. One of the most useful ways of doing this is by testing products with end users, and remote user testing is one method we use to do this at scale. As detailed in other blog posts remote user testing is conducted by asking users to complete a number of tasks online, with their actions being recorded by a bespoke piece of software. This gives us task success rates, time to complete task, and common paths that people take through the site. This method has proved really useful for testing Inside Government, particularly when used in conjunction with traditional face-to-face lab testing. The latest round of remote testing involved 400 online participants completing five tasks on the latest release of Inside Government. The tasks that they were asked to complete were similar to those asked in the previous round, and included finding policy information, consultation information, department information, ministerial information, and contact information. Users did, however, struggle to find consultations on the site. Users didn't understand where to start looking, or under what navigation heading it would be listed. This issue was also picked up in the face-to-face lab testing, so it was quickly addressed by the product team and a solution is now undergoing further testing. Remote usability testing has proved to be really useful at GDS. We can test products quickly, easily, and cheaply with a large number of potential users, and findings can be given to the product teams quickly. Using this method of testing on Inside Government alongside agile working methods has really helped us understand how the product has improved – while also indicating where further work is needed to make it better for users. Were you aware that the House of Lords' Secondary Legislation Scrutiny Committee have asked for an urgent review of consultation policy, and that one of their recommendations is a single government website listing all open consultations in the order in which they close??? (http://www.publications.parliament.uk/pa/ld201213/ldselect/ldsecleg/100/100.pdf para 11.) I don't suppose that's the "solution" you "quickly" identified and are currently testing....??? Yes, we're aware of the considerable history of work to make consultations more visible and accessible in one place. 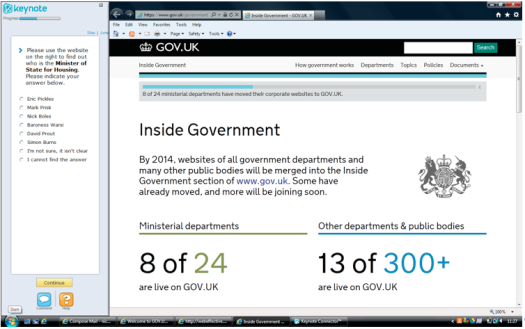 Bringing departmental websites in to be part of GOV.UK helps greatly with this. It only includes consultations from those organisations that have gone live as part of GOV.UK, but this is increasing rapidly with the expected completion of website transition set for April this year. Further development will include a filter for open/closed status and additional tools to support response to online consultations. What tool(s) do you use for remote usability testing? We use a piece of software from Keynote called Web Effective. It allows us to do regular surveys and remove usability that includes all the tracking etc, and follow up questions.